Another postcard picked up via TradeMe. A car enthusiast has already picked out that, going by the makes shown, the image dates from c.1951 to 1956 (the year when trams ceased operations in Auckland). 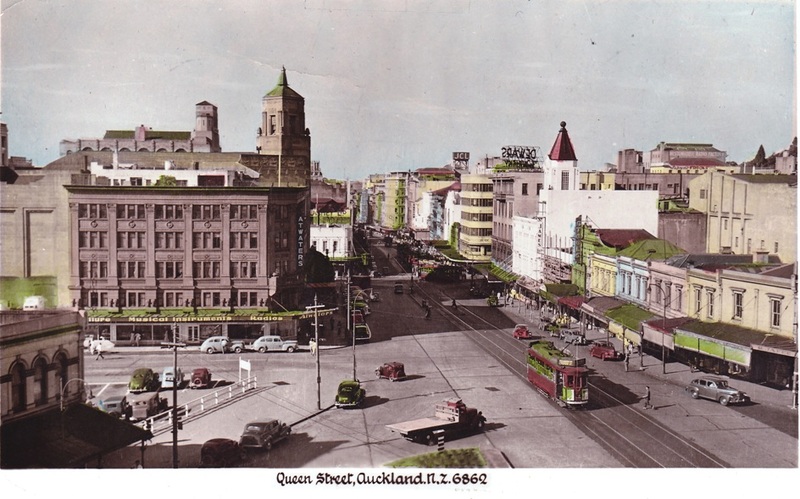 It was taken from the Town Hall, and shows (centre, bottom) the still-open Greys Avenue (from which the flat-bed truck is turning), (left, bottom) part of the retail block (by then the Greys Ave "Chinatown") demolished later for Aotea Square. Just north of that, west side of Queen Street, we can see Myers Street (formerly the Market Entrance to the City Markets), now all just part of the Planet Hollywood/Midcity development beside Aotea Square. The five-storey building with Atwaters signage is the Ferguson Building, today just a facade on the streetscape. The site was once that of the Anchor Hotel. Immediate;y behind that is the tall almost-oriental tower of the Civic Theatre. To the left of that on the skyline, the rear part of the Smith & Caughey building. To the right, shops at the corner of Rutland Street, heading down to the St James Theatre (colourised red turret), a Dewars Whiskey neon advertisement from the rear, and to the left of that on the skyline "JCL" (for John Court Limited, where Whitcoulls is today, corner Victoria and Queen Street). 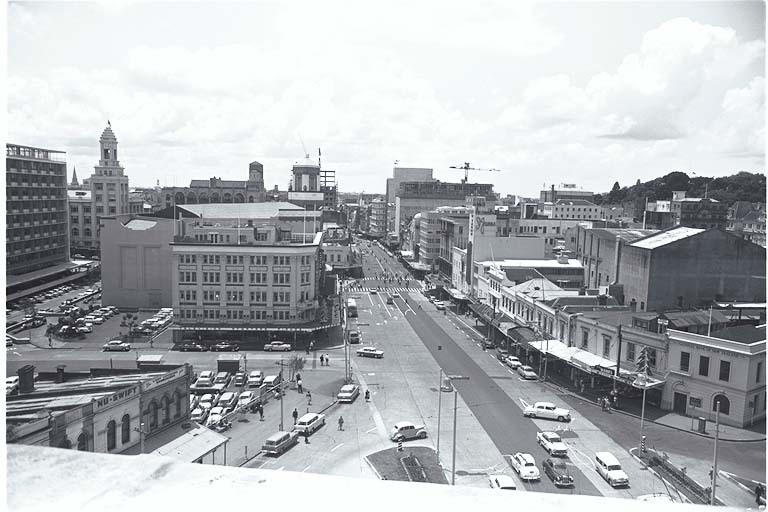 To compare, here is a view from 28 November 1963 (by kind permission of the Sir George Grey Special Collections, Auckland Library. Photographer unknown). Reference 7-A1042. For this one, though, the photographer got just that bit further up the height of the Town Hall. Great to see these images of the Auckland of my childhood, when the city had less than half a million people.